The eXtreme Dog Fence® Pro Grade System features a super small collar and individual correction levels making it the system of choice for multi-dog households, even where there are dogs of different sizes. The system is feature-rich and has specialized options like comfort contact points, Temp Check, Wire Check, & Frequency Selection that no other dog fence system offers. The overall reliability of this system makes it our number one choice and our pick over more expensive and equally feature-rich systems. Small & Lightweight: The eXtreme Dog Fence® receiver collar is one of the lightest and smallest collars in the industry (surpassed only by the small dog specific PetSafe Little Dog). Weighing in at only 1.1 ounces it is suitable for dogs right down to 8 lbs. For dogs smaller than that you'll want to go for the PetSafe Little Dog, which tones down the correction strength in addition to the small collar size. Comfort Contacts: The eXtreme Dog Fence® receiver collar uses unique conductive rubber contact points to increase collar comfort for your dog. While the comfort contact points conduct the correction just like metal contact points, they are softer and less irritating on your dog's skin. The comfort contact points make this system the number one choice for dog's with sensitive skin. 8 Individual Correction Settings: The small eXtreme Dog Fence® collars are capable of 1 tone only setting, 5 unique correction level settings and 2 progressive settings that automatically increase as the dog continues toward the boundary line. Each collar on the system has its own correction level setting, but rather than being set on the collar itself, they are set at the transmitter. The unique correction level settings and lightweight collar make this a good choice for multi-dog households where all dogs are 8+ lbs. Exceptional Waterproofing: Because the eXtreme Dog Fence® collar does not have any buttons or dials on the collar itself, the waterproofing is really perfect. The collar can be fully submersed while functioning. Because of this feature we recommend the eXtreme Dog Fence® for rainy climates as well as lake front installation or yards with ponds or pools. 10 Acre Capacity: The eXtreme Dog Fence® PRO-Grade dog fence is capable of installations of 25 acres or less. While other fences in the same price point offer greater coverage, 25 acres is more than enough for most urban and suburban properties. 500 ft. Heavy Duty Pro-Grade Wire: Our Pro-Grade Kits include upgraded 14-gauge PRO-Grade wire. This heavy duty, polyelethene plastic coated wire is what would come with a professionally installed system like Invisible Fence®. Upgrading to thicker, more durable wire helps prevent costly and time-consuming wire breaks. 50 ft. Heavy Duty Pro-Grade Twisted Wire: Although you could use two double long strands of wire to make your own twisted wire, this gets pretty messy and difficult if you need any decent length of it. Our PRO-Grade DIY dog fence kits save you the hassle by including 50 ft. of heavy duty pro-grade twisted neutral dog fence wire. External Surge Protection: External surge protection is the best thing you can do to protect your investment. Rather than let a rogue power surge blow your transmitter, simply plug in our heavy duty PRO-Grade surge protection module. This surge protector keeps your dog fence safe from lightening strikes and main power surges. Extended 10-Year Warranty: Our PRO-Grade systems are backed by an upgraded 10-year warranty. We extended the warranty to effectively triple the manufacturer's 1-year warranty. 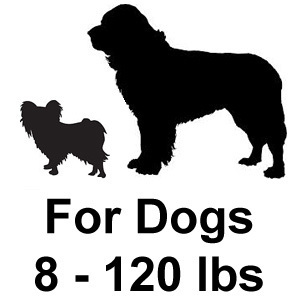 » For Dogs 8 - 120 lbs. This is a very good system. Just a bit difficult to set the collars at first. I like this system and the Perimeter Technology collar is smaller than the Petsafe collar we used to have at our old house. The system works perfectly and our dog was easy to train on it. The only thing I found difficult was learning how to change the level on the collars. It took a few tries before we learned how to do it properly, but now we can do it anytime. I like that this is an American made fence, and the transmitter is digital. We're going to get a border collie and add her to the system next. Awesome fence setup man. I love this Perimeter Technologies in-ground fence system. This is the coolest thing I've seen. I didn't know anything about the electric type dog fences, until I found the Flexpetz website. I was actually considering the thought of installing a chain link type fence, but it's just so expensive, and you can't really take it with you if you move. We spoke to Jessy, at Flexpetz, and she explained to us (in nice detail) all the nice features that that system packs. She told us about the Professional Grade version of the fence, which we chose because we don't want to have to worry about doing any repairs or wire replacing anytime soon. We got the fence and set it up last week. Everything was just as Jessy described. She really knows her business. I would recommend anyone to try the Perimeter Pro Grade fence. It's a very solid solution and we're very happy with ours. Needed a more durable system. I bought one of these systems from a business that sells and installs these. After so many service calls, I got tired of paying those people. I watched the tech closely when he would come service my system and realized that my problem was wire breaks. The cheap wire that they used to install my system was able to be broken pinching it to hard, which is ridiculous. The wire that was included in this Pro-Grade package is going to serve me just fine I think. I put it through some tests before I buried it and it is very durable and will not need to be serviced twice a year. I did hit a section with my yard trimmer and it survived that with little damage, but I still do not recommend this. Really enjoying the benefits of this quality package. Not only for the high quality equipment, but also for the customer service the FlexPetz techs assisted me with. Love the PRO-Grade option on this site. I purchased a similar system for a previous house and decided not to take it with me. The wire was so thin and it always seemed to break on me. After getting the pricey quotes on a real wooden fence, I decided to do more research. The price comparison was an unreal amount of savings, so my husband purchased this system and wanted to go with the PRO-Grade package for the added benefits. The only thing I was disappointed with was that I didn't find this product sooner. This site really does offer so much help with everything. With the videos and information on the site we were able to pick out the perfect fence for my dog Jessy. Not to mention it was installed in less than half a day by my husband alone. The customer support was great too. Very happy customer. The Perimeter Pro fence is really worth the money spent. Works perfectly. This fence system by Perimeter is the best. I was shopping for a good electrical fence system and came up with Flexpetz in a Google search. Their staff asked me some questions, and then are able to guide you toward the systems that meet your individual needs. I looked at about 4 different fence kits, and ended up with the Perimeter Technologies in-ground fence, in the Pro Grade package. It comes with everything you need to get setup and working. It even comes with a surge protector that has a lifetime warranty on it. As lots of the other reviews state, the setup is pretty straight forward and not too difficult. The training is pretty fun and doesn't take up too much time to do. Mine wasn't even 2 weeks long. I have never been the type to pass any training tasks off onto someone else. I was actually looking forward to that part, just to see the change. Now, everything is all set and running and I think everyone is a happy camper. I have never used a electric dog fence but flexpetz made this easy. I have totally relied on the free tech support to figure out how to install this system and it was easy. My Springer Spaniel learned the boundary in a week. I never heard of an electric dog fence until two weeks ago. I was about to install a $7000 physical fence because my HOA requires a specific PVC fencing. 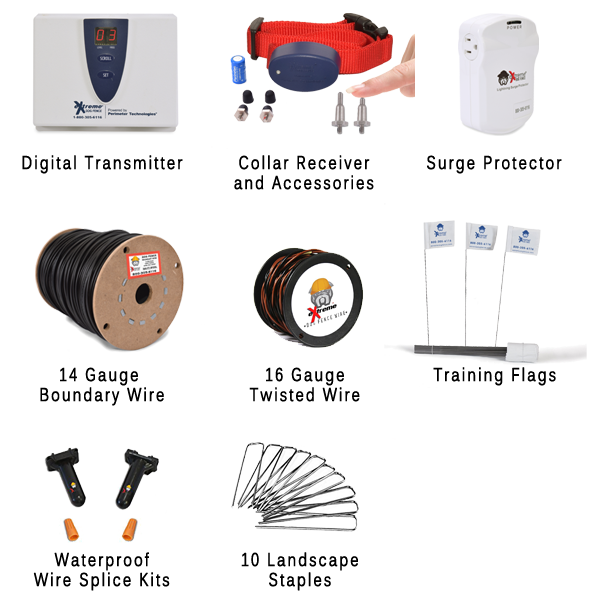 I was able to get this system with the best wire and surge protection for >$400. I could not be happier to save $6600 and my containment issue is solved. Flexpetz offered free tech support for the installation and training my pet. The Pro Grade package came with a 3 year warranty and 1 year pet containment guaranty. There is lots of testimony as to the reliability and effectiveness of the Perimeter Tech system but the warranty and guaranty gave me all the comfort I needed to make the purchase. Love it. Go USA. I like this Perimeter pro fence. It does everything it says it does. This thing is pretty cool. I thought it was going to zap the dogs like the livestock, so I was a little nervous to buy one. I know two people who have a fence like it but they're not American made. I did get to see how they work and I was surprised at the small amount of electricity that comes out of there. Doesn't hurt my dogs, but this fence sure can get a dog's attention and keep them in place. I figured that if I'm gonna spend the money, I may as well get the good stuff. So I chose the one with the better wire and longer warranty. Glad I did. This thing is perfect for me. Pro Grade work for me. This is my second system and experience had lead me to better quality wire. Wire breaks with the 20 gauge drove me nuts on my first system. I had no idea that other wire would work with an electric dog fence until I found FLEXPETZ. The Extreme wire that came with the Pro Grade package is nothing less than amazing. It is like a small cable compared to the kite string 20 gauge. I was very happy when the Tech at FLEXPETZ told me there was an option to buy an American made electric dog fence. I assume all electronic are shipped from Chinese manufactures. Perimeter Technologies is actually manufactured in PA. This is a big deal to me. Anyway, this is a great system. Designed to last. I love this dog fence system. It works great. I am pleased to write that I am super satisfied with the quality of this dog fence system. It was very simplistic to install and very easy to use. This system has made my neighbors extremely happy. My dog is no longer wandering into the neighbor's property. My dogs are getting exercise every day. The system is awesome and I recommend this system kindheartedly. Thank you. FlexPetz.com. I almost bought my electric dog fence from Tractor Supply but was concerned about installing the system. I was asking lot of questions and not getting any answers from the staff at Tractor Supply. I found FLEXPETZ and the free tech support was unbelievable. They helped me find the right system for my pet and property. They helped me design the lay out of the wire and gave great tips for installation process. There are lots of literature and videos on the website as well. Thanks for the help. I'm glad with the system I purchased. It fits the bill. The shock fences here on Flexpetz.com are pretty high priced, compared to the ones in Walmart. However, I also priced some other fences that companies come out and install for you. That's when I realized the scale I was using was missing the high end. I can believe people actually pay $2000 for these things. After learning that, it seems I got off pretty lightly. I don't know what the quality of the Walmart ones are, but this Perimeter Professional package is just great. I couldn't figure out the digital stuff at first, so I had me a cup of coffee. Once I figured it out, and set it up correctly, the whole thing seemed like child's play. I called the fellow at Flexpetz.com, to ask if I had the collar setup right, and he helped me verify the setting. I guess I need to train Blackjack on it now. I'll be back to Flexpetz.com again. I am impressed with the overall quality of this package. I needed an electric dog fence and was highly referred to FLEXPETZ.com from my neighbor for the Pro Grade package. You choose the correct transmitter and receiver collar and FLEXPETZ packages all the best components in the system. All the videos and illustrations on the website were very helpful for the installation and training process. Free tech support was available for additional detail on training. I am very happy to let my dog out without a leash and know he is safe. All installed and working great. Now to start training. This Perimeter fence setup takes only 3.75 hours to get setup and running. This fence was probably the best choice for me, as I don't have a dog that would require the Stubborn Dog fence. I like the pro version of the fence, not only for the better wire, but also for the 3 year warranty. I don't have much experience with this type of system, so if it were to break down on me -I'd be hurting. It's not expensive, as compared to Invisible Fence Company, but it is an expense. I'm excited to get started training, and see how the puhli reacts to it. Wish me luck. Good transaction. We're really happy with our purchase. Very good. I'm quite pleased. Pro Grade w/ Perimeter Tech. I was a professional installer of Invisible Fence electric dog fences for over 15 years. I often thought that anyone could do this type of installation if only they knew how easy it was to do. When I found FLEXPETZ I was so impressed with all the videos and illustrations I wish I had started this online company. We would charge $1000 to $2000 in labor depending on the size of the property. I am retired now so I don’t mind saying the Invisible Fence equipment is ridiculously expensive. Anyway, I’m not here to bash Invisible Fence. They provide a service that is excellent for people that don’t want to touch the installation. The DIY people out there will save $1000’s over the life of a system installed by themselves. Replacement equipment and batteries are a fraction of the cost and no one will know the system better than you; so if there is a problem… you know how to fix it. Another thing I highly recommend is the Pro Grade Package. It has the best wire available to insure the system will be trouble free for the life of your K-9. Inferior wire will function fine but if you want longevity order the Extreme wire in the Pro Grade package. I chose the Perimeter Tech system. The quality is equal to the Invisible Fence equipment. In fact it is very similar in the way it functions. This happened to be the best solution for my pet Collie. All this and free tech support compelled me to write an extensive review. This is too good of a deal not to share. I have referred a neighbor and a family member. The only unfortunate this is I have been recruited to help install both systems. So much for being retired. Thanks FLEXPETZ.com Keep up the good work. I purchased the Perimeter Ultimate - PRO Grade fence kit and really like the system and the upgraded kit. I found the reviews on Flexpetz web site to be very helpful and quite accurate. I did a lot of research. Before purchasing, I contacted Flexpetz several times via their on-line chat to ask some questions. They were extremely helpful. The only issue that I had was that FedEx shipped my system to the wrong address a couple blocks away. Flexpetz went out of their way to help get the FedEx's error corrected and contacted me. By the way, the shipping label was correct. Fortunately, the person that received the package brought it to me the next day. This is a great business that takes customer service very seriously and does a great job of it. I particularly liked the pro-grade kit. I found the 14AWG wire to be much easier to install than what I had with my previous system. The wire laid out flatter and I didn't have to be near as gentle installing it. The pro-grade kit is definitely worth the little extra money. Seems like this is the best system out there. But the price is great. A plus. I love the fact that this is American made. I am not a big fan of spending my money in other countries. This system is a great buy, especially with the upgraded wire and extra stuff. I'm not the best technical mind out there, but was able to get the digital transmitter all set on this thing. The collar is just right on level 2 and I got everything working in a single day. I'm not a Perimeter company employee, but I would definitely recommend this fence package to anyone looking for such a solution. I've never gone wrong with any Flexpetz store products and the Perimeter fence is a fantastic value on their part. We currently have a dog that unfortunately is not very bright and very stubborn. If he ever gets loose-he's gone! Still and all we love our pooch a system like this sounds like a great for for us! It seems effective and Bluto can enjoy the comforts of his outdoor experience while our minds are at ease. We were especially thrill to know that the collar is water proof as unexpected rain storms where we live are common. The 4-5 month life of the battery is an added convenience. The price seems reasonable as well as the warranty. We are really enjoying the invisible fence Perimeter system, defintely a well worth while investment.